When it comes to iPhone cases, I've been loyal to Incipio's dual Silicrylic case for my iPhone 4s. I'm always head over heels for the witty, colorful cases by Kate Spade and Tory Burch. But those only come in the snap on plastic cases (which I know will not save my iPhone from a fatal drop) or the all-silicone kind that stretch out over time and don't fit on my phone. 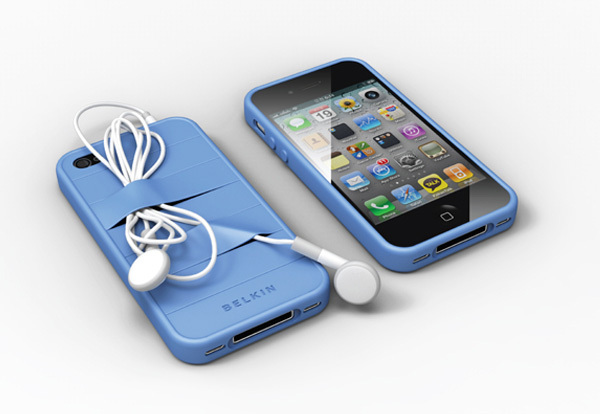 The Silicrylic has a silicone cover and a hardshell that snaps on over, without looking too bulky. Am I picky? Absolutely. I won't deny that. Protection comes first for my $200 phone! (But I do think Otterbox cases are a little over the top!). So while I love my Incipio case, I've got my eye on the Elasty. How neat are these? It's a silicone bumper with elastic straps across the back -- perfect for creditcards, folded bills, or pens. Or, you can tuck your earphones under a strap without wrapping them around your phone. As of now, it's still in the rendering phase, but Belkin granted the case with a design award, so keep your fingers crossed that the company picks it up! OH. MY. GOSH. How come I never heard of these case before!? They're such an amazing idea! I'm going to have to buy one ASAP!